Twice this week we’ve had a visitor unwilling to get out of his vehicle, afraid of the geese. The dogs were all barking their fool heads off, tethered or behind a fence, so I wasn’t sure why the guy wasn’t getting out. (oil delivery and mailman) So I go out to investigate and even when I promise cross my heart that the geese won’t attack them, they were both very, very wary. I must have the tamest most wimpy geese in the universe because if you are a stranger and walk near them, they will immediately turn around and almost run away from you, scared to death of you. They’ve never had a stranger be mean to them, at least not that I know of, but they are very, very wary. For me, they follow me around like the pets they are. They love to groom me if I’ll sit still long enough. They really miss my milking time, which is when they thought they got undivided attention from me. I’d give them lots of eye contact, nod and smile while they’d tell me all about very important goose things. It would sound like chatter, with their voices going up and down, all calm. They love to make eye contact with me. If my hair is braided and my hands are busy, they’ll eventually get it all undone. Their version of grooming me involves taking a clump of my hair up near my scalp and gently check for bugs the whole length of the hair. That’s how I know they love me. They wouldn’t want me to have bugs, you know. They don’t like to be pet, particularly, but several of them like to rub their necks on my arm if I hold it out straight. If it’s calm and quiet (and the dogs aren’t around), eventually a few of them will let me pet them if I mostly just gently run their neck against the feathers. It’s very sweet. To introduce these two new guys who will be visiting periodically to deliver the oil and the mail, I showed them both how sweet the geese could be. We squat down and just stay quiet, and the geese will come a little closer to check us out. They both thought it was really neat to find nice geese. I’ve had so much fun raising them. So great, LOVE this story. What kind of geese are they? 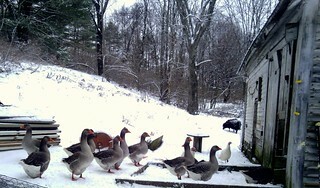 We’re hoping to add some geese to the farm next spring. Our ducks are kind of like your geese, they love to follow me around and they actually love it when I scratch their bellies. They come up to me, stretch up, shake their tales and look at me so I’ll pet them. Have you read about Konrad Lorenz’ work with geese? Fascinating.